We offer a comprehensive piano polishing service. 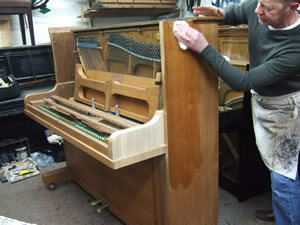 We are able to provide a complete French polishing for your piano. Including: colour change; strip and re-polish; casework touch-ups; and repairs. Jobs can be done in our workshop or in situ, depending on the task. We are also able to do poly casework repair, and re-sprays. Should you wish to change the finish of your piano from French polish to the shiny Poly finish, we can arrange this for you too.